When it comes to true sticking power, nothing holds its ground like chewing gum. Not to mention clinging to the bottom of your shoe or even worse, your seat on the bus or in the cinema. 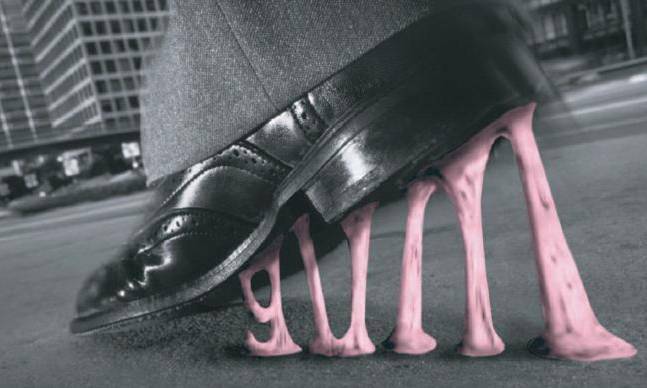 The sticky problem of discarded blobs of chewing gum costs taxpayers £150million a year to clean up. But scientists may have found a solution: the world's first non-stick gum. Washed off pavements by rain alone, it could save millions in cleaning costs - and put an end to the days of having to scrape discarded gum from shoes, clothing and even out of the hair. Said to be tasty and chewy without being sticky, the Rev 7 gum , as it is called, could be on sale early next year. Its development, by scientists at Bristol University, could end a 25-year world-wide quest to find a low-adhesion chewing gum. Made of a mixture of synthetic rubber, chalk, wax, sugar and flavourings, chewing gum's stickiness comes from an adhesive compound also used in car tyres. The scientists say they have managed to replace this with a non-stick synthetic material. This is also attracted to water, meaning it is easily washed off, the British Association Festival of Science in York heard. Tests on pavements have shown that it can be washed away by nothing more than rain. Other tests showed it is equally easy to peel off shoes, the underside of desks or even tease out of hair. Subject to safety approval, the gum is expected to go on sale next year, costing around 40p a packet. Although a small-scale product initially, the scientists are already talking with major confectionery firms. The gum's inventor, Professor Terence Cosgrove, said: "Chewing gum is a social habit that goes around the world. "But, unfortunately, a large number of people dispose of their gum inappropriately. "I am sure you have all sat in the cinema or in someone's car and your hands have wandered and found a disgusting sticky mess under the seat. "It is unpleasant, could have health issues associated with it, and is unsightly. "You walk down any high street and you see chewing gum stuck to paving stones and councils spend a lot of money trying to get rid of it." Professor Cosgrove, a physical chemist, added: "We have taken out some of the sticky components and replaced these with one that still gives a chewing gum experience but without the stickiness." At present, the gum comes in just two flavours - mint or lemon - but there is scope for more. Gums for nicotine and caffeine addicts could also follow. Its entry to the £400million-a-year market could lead to cleaner pavements across the country, as well as save the taxpayer millions. Chewing gum removal from pavements costs councils £150million a year, with London's Oxford Street alone sporting an estimated 300,000 pieces of discarded gum. Discarded gum also poses a danger to pets and wildlife, getting tangled in fur and feathers and causing suffocation when swallowed. Emma Brennan of the Keep Britain Tidy Campaign, said non-stick gum could "make a massive difference" to the country's streets. "It can cost up to £20,000 to use power-washers or steam cleaners to remove gum from town centre," she said. "People then come along again and throw down gum and you are back to square one. "But it is important that people don't use the invention of non-stick gum to justify dropping it on the pavement rather than putting it in the bin."